Mummies found with the new method of mummification of linen and plaster or natron, are dated back to the Old Kingdom (2650-2150 B.C.E.). Natron is actually a natural type of salt that is found in Egypt. It’s chemical composition consists of a sodium bicarbonate (baking soda) and sodium carbonate (washing soda), and sodium chloride (table salt). Interestingly, sodium’s chemical true name is Natrium in our present periodic table. In the mummification process, the natron was used to basically salt and preserve the body. The body would be placed on a special table and dissected open, and natron would be place inside the body cavity. The Ancient Egyptians would also place natron on the exterior surfaces of the body to help dry and preserve the body. Eventually, the Ancient Egyptians progressed in their mummification process by removing the internal organs because they learned the internal organs would also decay quickly. These organs would also be treated with a natron solution and placed into four separate canopic jars that would also have significant spiritual meaning. The organs that were treated and saved were the lungs, stomach, liver and intestines. Starting with the Fifth and Sixth Dynasty pyramids, these canopic jars were placed into a separate stone compartment of the burial chambers. The Queen Hetepheres, the mother of King Khufu, from the fourth Dynasty; her organs were actually preserved in a natron solution. It is also believed that the burial of Queen Meresahkh, also from the fourth Dynasty, her body was left in a natron solution for approximately 200 days as preparation for mummification. The embalming process usually took seventy days. There was some delay between the time of her death and her burial. But to submerge a body into a natron solution, the large container would have to be larger than a bathtub, and these containers have not been found as of yet. The mummies found from this period are even more elaborately preserved and allowed us to more insight into the burial rituals of the Ancient Egyptians. As their civilization progresses, so does the customs and rituals for the preparation of their afterlife. 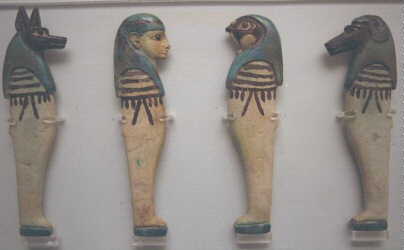 The mummies that were best preserved were of royalty or within the royal court. There were certain measures taken for preparation for the afterlife for a common person, but not the extent for which was done for the royal court. Fortunately, the priests and bureaucrats of the 21st and 22nd Dynasties realized the royal tombs were being ravaged and plumaged in the Valley of the Kings, so the priests reburied the mummies in old tombs, so not to attract attention. As the royal tombs were being transported and cleared, the priests had the opportunity to view how the mummies had held up to the time that had passed since the original linen wrappings were removed by tomb robbers looking for jewelry. The priests and embalmers of this era wanted to continue to improve their predecessors’ technique. They would try to insert other packing materials within the body cavity, to keep the body’s appearance more life like. Materials used were sawdust, rubble, aromatic plants,  or more linens and more natron. This was not always successful because sometimes the body would look more swollen or even pregnant. In some cases “the materials would burst through the skin, leaving a cracked, very unattractive face.” During this era, the mummies would also have false eyes made of stone, glass or stone, and bodies were painted, yellow for women and red-brown for men. Some of the mummies also had fake wigs or yarn twisted into their own hair. The organs were placed in the canopic jars up to the 21st dynasty, but mummies found after the 21st dynasty had their organs now wrapped in linens and left inside the body cavity or placed next to their body. It is believed that the priests decided this because the canopic jars in the past had been smashed by robbers, so they would leave the canopic jars in the same tomb as the mummy as well. [2, 5] Even into the Greco-Roman period and the spread of Christianity, mummification continued, but the burial mask from the New Kingdom era were replaced with painted portraits of the deceased on wooden slabs wrapped under the linens over the head of the mummy. A CT-scan of mummy from 22nd dynasty, the highlighted area shows wrapped organs which had been placed back into the body cavity (the spinal cord is at the base of the picture). The mummies found after the 25th Dynasty, were either in the traditional mummification custom or just the skeletal frame with the intricate linen wrapping. This was investigated by an X-ray image. [2,7] The mummies found in the later period actually are from the middle classes, and the royal mummies from these periods have not been found. During the Roman period, some of the bodies found had gold leaf applied to the skin, and some of the mummies were still well preserved from the Oases because of the ideal climate. The artificial mummification process slowly phased out in Egypt “as the old religion believed that the preservation of the body was essential”[2,7] was replaced by Christianity and Islam. But the few Christian mummies that have been examined show to have minor variations from the classical treatment. The dead were buried in their past everyday wear or in “ceremonial vestments” instead of the linen wrappings or bandages.